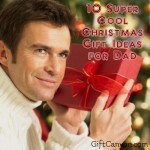 The Dad-Who-Has-Everything is the type of person who is very hard to give gifts for. He has a huge house, own several corporations, barely works but overflowing with money. Yep, he has everything. 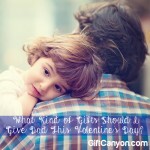 The strategy to making a rich dad happy is to tug into his heart strings. You see, while he does have everything, there is one thing that he constantly needs and cannot be bought by money. Your love! 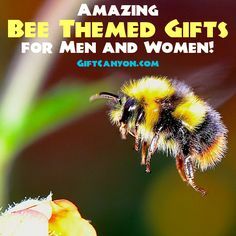 Focus on heartwarming gifts or those that you can personalize and he will swell in joy. 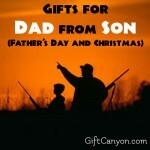 Here are some gift ideas for the dad who has everything! This is a really touching poem! 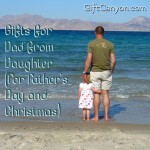 Your dad might even shed a tear (man tears!) reading it. 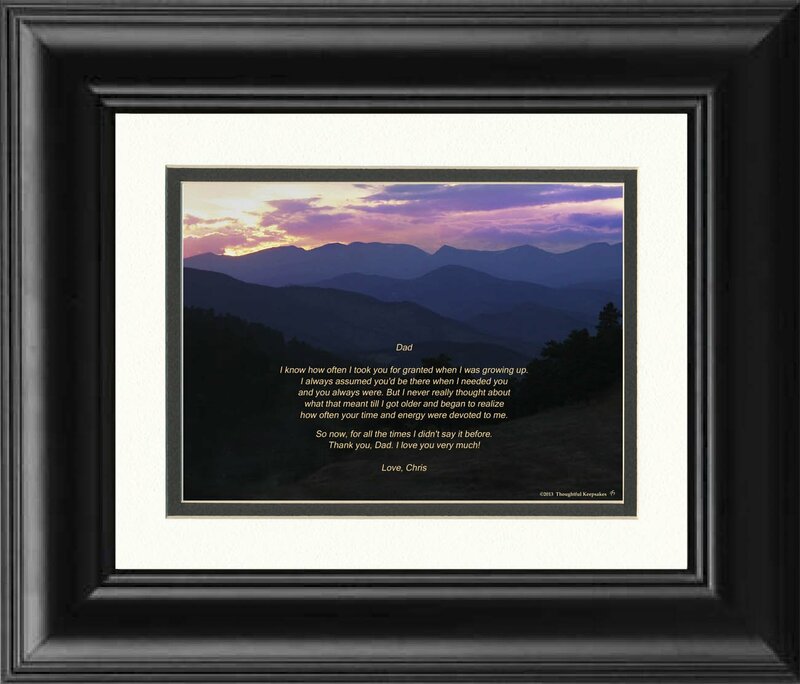 Behind the poem is a scenic view of mountains, fitting for a nice poetry. This framed poem is very customizeable as you can add two lines of text above the poem and two more below, aside from the To and From sections. The manufacturer always deliver quality framed poems! All grown up? 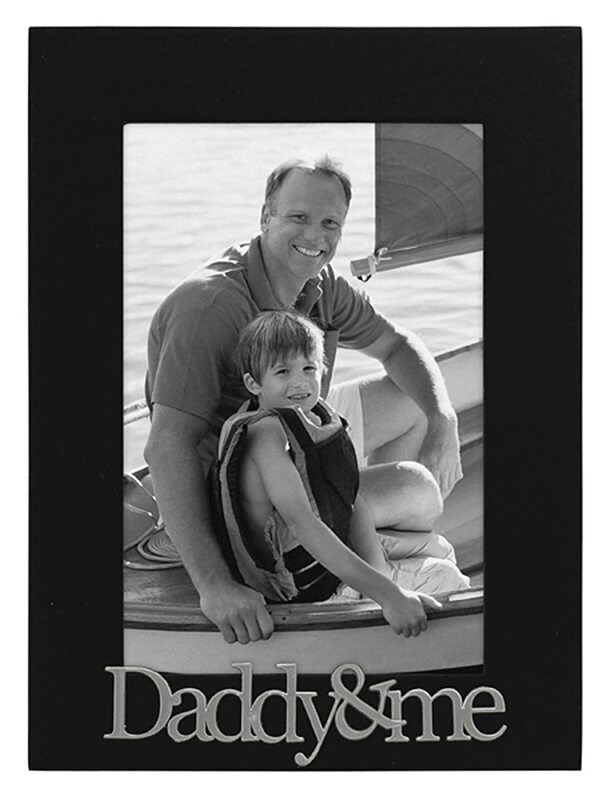 Here is an idea: find a picture of a baby you and your dad and buy this super cute "Dad and Me" frame. I am sure your daddy will be touched at how much you have grown! 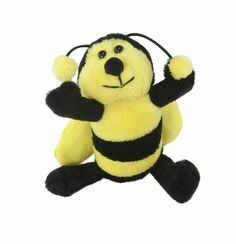 this frame is not girly, so your dad will not be shy displaying this on his office desk or in his den. 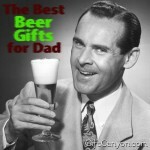 This is a nice touching present for the dad who has everything. Does dad love cooking the Sunday barbecue? Then you should get him one of these "King of the Grill" spatula. This grill can be personalized where the manufacturer will engrave your dad's name into the handle of this really nice cooking tool. This also doubles as a bottle opener... check the other end of the spatula on the photo! Aside from Sunday barbecue with the family, he can also use this as a macho tool when cooking meat with his buddies. A man should drink wherever, right? This where this credit card sized bottle opener comes in. This Man Card is a really durable piece of bottle opener and it can fir inside his wallet, so it can come with your dad wherever he goes! 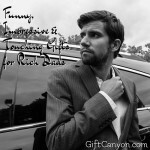 His name will be laser-engraved into this man card, making is a really personal gift! This is another touching framed artwork for dad! If you do not like poems, then a simple message, like "You are the world to me." will do. This framed message comes with a really tasteful artwork that says "DAD". 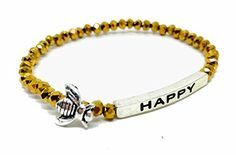 The manufacturer will ask for your name(s) so that they can add it into the from section. This framed artwork can be made even more personal by adding a simple one line message, up to 30 characters. 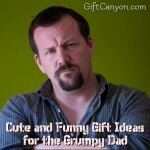 If you have siblings, then this photo mug will be a nice gift for the dad who has everything. 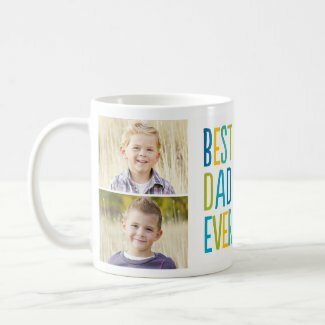 Simply put, this mug says, "Best Dad Ever" plus the pictures of you and your siblings! Here is an idea: take your baby pictures and dad will have a fun time identifying who is who and telling who is who (again) to anyone who sees him drinking from this beautifully crafted mug. 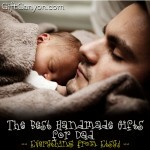 This is a perfect gift for the coffee loving dad! If your dad-who-has-everything has an office, then you can give him is really cute Dad Clock. This is a nice desk clock (which is always helpful for office desks) shaped in the words, DAD. The center timepiece looks really elegant, showing a white face and roman numeral-styled numbers. You can further customize this by having the manufacturer engrave you and your sibling's names on the clock. 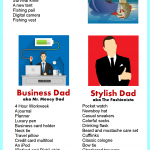 Boost your dad's ego! Tell your dad that he is the best (in the galaxy!) with a shirt. This super comfy shirt says "best Dad in the Galaxy" because you know here is. This shirt can come in different colors and style, just customize the shirt in the Zazzle page. 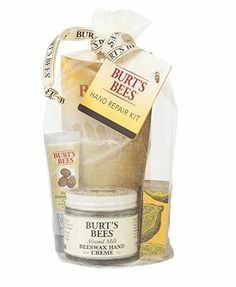 This is a really cool gift idea for a parent! basically, this is a keychain shaped by your childhood drawing! 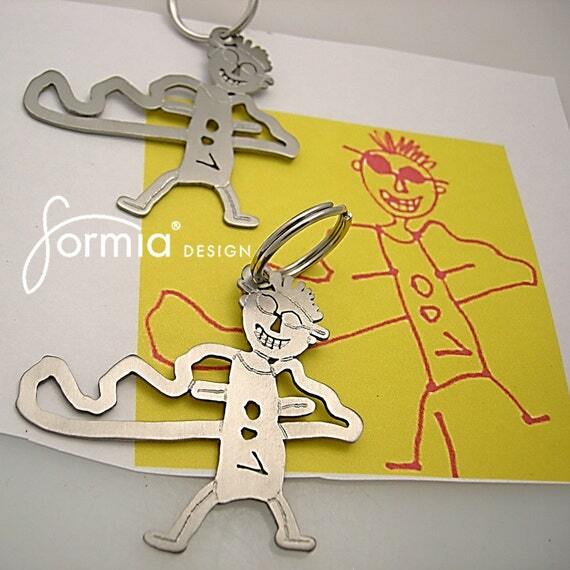 If dad kept your kiddie drawings, borrow it from him and have it turned into a keychain by Formia Designs. 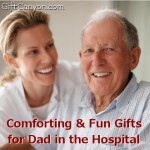 If your dad has a grandchild from you, you can also use your kid's drawing and give it to him. Cool idea: have your kid draw grandpa and have that turned into a keychain! 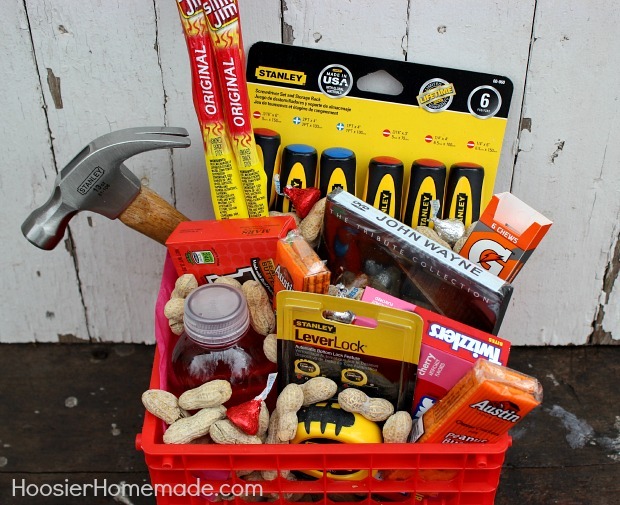 While the picture clearly says for a husband or boyfriend, you can actually turn this idea into a man bucket for the dad who has everything! Just do a little research on what he likes and what he does as a hobby (golf balls, sports, beef jerky, Tycoon Magazine, etc) and put them into a nice many bucket. 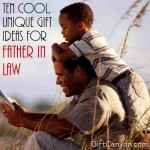 This is something even a man who has everything will be delighted to have because it shows a labor of love. 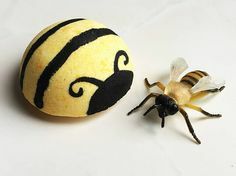 You can check more ideas at Hoosier Homemade.